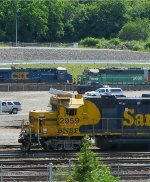 Title: BNSF 2088 on the ballast - note "DERAIL" sign! 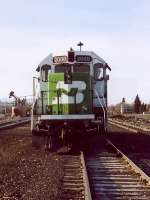 Description: Power for the Butte-Garrison local rests in Butte. Description: Pulling out of the Port of Vancouver. Description: Two green Geeps pull a big cut of cars out of the Port of Vancouver, across the BNSF mainlines, and into the Vancouver yard. Description: Using the power from yesterday's Annie, the Burley local crosses the Skagit River with a respectable train of 72 cars for Burlington yard. Description: The Burley local works northbound on the Bellingham sub. Believe that is Mount Pilchuck just barely visible in the background. Description: Ex-BN GP38-2 2088 brings a transfer south from Braid Junction in New Westminster, BC. Description: BNSF 2088 - oh, hey, wait! That little Geep doesnt have remote towers and units on top yet - looks like we have some new classic BN green yard power this weekend. What a fine how-do-you-do meet-and-greet. Maybe she came from somewhere else on the Wet (sic) Coast so she feels at home. Description: BNSF 2088 - BNSF 1599 yard pair... springing ahead four hours from all the power groups stuffed around the area noted previously - Ive returned in an effort to finish attempting to put them all onto the sensor on this busy Tuesday. Description: BNSF 2088 scooting between the middle and north yards as part of a dynamic duo, UP double stack northbound and BNSF autorack southbound provide mobile backdrop. Description: BNSF 2959 dropping down to the yard run-around/by-pass moving between the middle and north yard with CSX 861 and BNSF 2088 back on the turn-table spur in an interesting mixture of color at Vancouver Center on this sunny day of May. Description: BNSF 2088 idling with her sister on bridge protection duty beside the Vancouver Amtrak Station... wish I could figure out where that "fancy GPS location identifier" button is, because I appear to have hit it for this shot... see? You can tell exactly what city I shot it in: "Vancouver, WA," right there inserted on the picturesque lamp-post. Now if only I could find the "locate nearest train" button, Id be all set. Description: BNSF 2104 - BNSF 2088 yarder pair now in Wishram, although for BNSF 2088 routinely caught by us in Vancouver and BNSF 2104 occasionally in Vancouver... now showing up as a blur (thanks Sony) in Wishram.